What I have painted, in fact, represents a French Leclerc on maneuvers in Qatar. It turns out that the UAE tanks have a very large number of very obvious differences from the French tanks. Even more than I imagined. 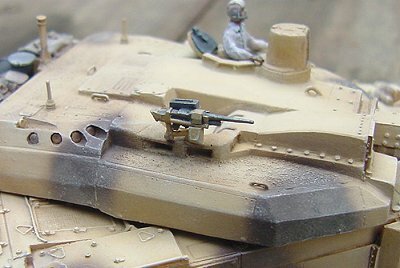 While building my tank, I had seen photographs of tanks with two different "desert" paint schemes. 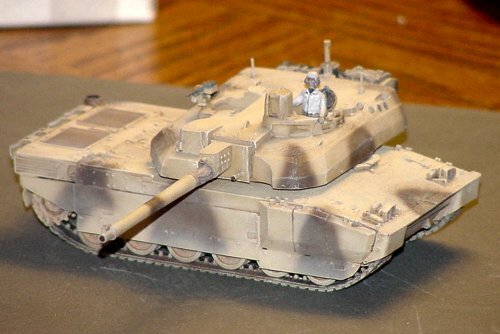 I had incorrectly assumed that the solid yellow scheme was early UAE tanks, and the camouflaged version (which I painted) was a late UAE tank. 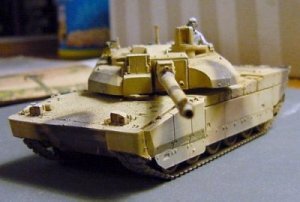 In reality, the UAE tanks are the solid yellow ones, and like I said, have many obvious external differences from the French tanks. 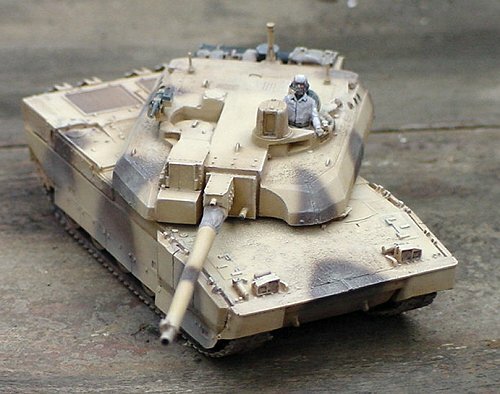 The paint scheme I used is for the French tanks in Qatar. But my version of this model still is not entirely correct. According to Ludovic, the French tanks in Qatar are of a different version than the RT5 Kosovo configuration. Apparently the turret roof has some differences which I should have incorporated into my model for this version. Well, as the saying goes, "Live and learn." The kit is absolutely fantastic. Instead of re-posting the scans of the kit parts, please refer to my previous Kit Preview. The kit is solid-bodied, so all of the hatches are molded closed, except for the commander's hatch. There is a recess molded into the turret for the commander figure, which is included with the kit. The hatch is detailed inside and out. 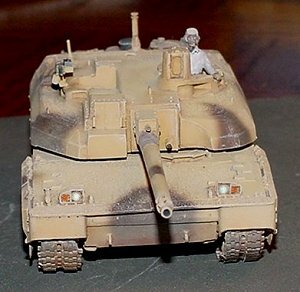 I have no idea if I matched the colors correctly, but the tan in the photographs looked very yellow, so I used British Gulf War Tan, which has a yellow tint, and Panzer Dark Brown, which matched very well to it. 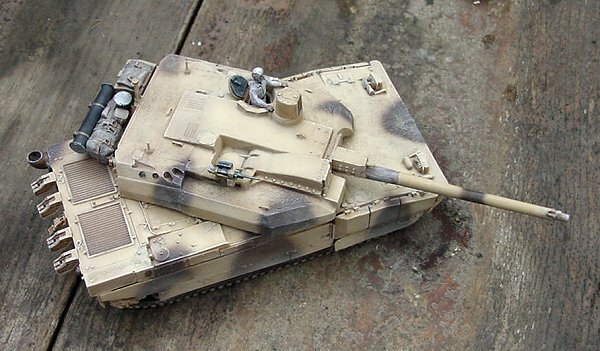 It would be really nice to replicate the camouflage netting which was often seen on these tanks. The construction was very straightforward and smooth, with a single exception. For whatever reason, it seemed that each track run was a single link too short. I bent them to shape in hot water (it actually worked this time! - nice resin), but I had to make an extra link for each side. The first side I worked on, I attached the very front first, behind the mudguard, and then worked my way back, until it was to meet with the track links which were molded onto the sprocket wheel in the rear, but there was a gap the exact width of a single link. After replicating a new link in styrene, I started work on the other side, but this time, I started from the rear first. I attached the sprocket wheel, then glued the track run to the links on the sprocket, and started working my way forward. When I got to the front, I thought it was fine, but when it was time to add the front mudguard, I saw that there was a visible gap at the top, so once again, I had to make an extra link from scratch. Considering how quickly the rest of the kit went together, I didn't mind spending the extra time. Once complete, this tank looks really wicked. The turret is as large as most WW II tanks! That's also the reason you don't want to glue down the turret, so you can turn it to see all the excellent hull detail. Oh, one other detail, the end loops for the tow cable are provided in resin, but the actual cable needs to be fabricated by the modeler. I twisted a pair of very fine, soft-metal wires into shape. 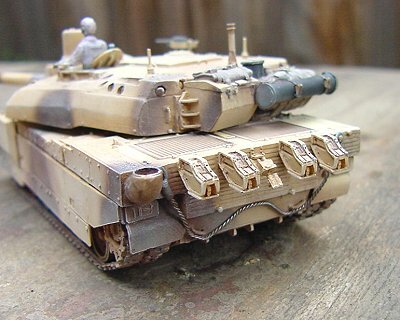 According to Jane's Tank and Combat Vehicles Recognition Guide, the kit scales perfectly to 1/72nd. Have you ever had something sitting right in front of you for a long time, and never notice it? Just last night, as I was putting the finishing touches on this article, I glanced over at the Jane's book sitting on the table, and wouldn't you know, right there on the cover was a beautiful, hi-res, color photo of a Leclerc (but the negative was reversed). I must have looked at that book a thousand times, but never realized that the photo would have been an excellent reference when building and painting this kit. 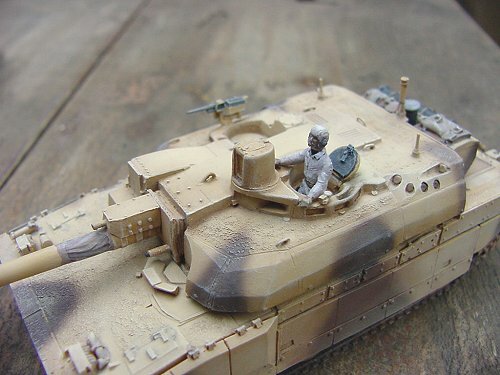 The photos I have seen of a UAE Leclerc showed the commander wearing a white, short-sleeve shirt and hat, which is why I painted my figure in white. But the Jane's cover photo, which is of the French desert version, shows a commander wearing camouflage shirt, and a black helmet. Drat! Maybe next time. After taking these photos, I've painted in the periscope and targeting viewports. Thank you very much to Ludovic Bertrand and ADV mini for providing the review sample.